I'd like to get a pair of those Pirelli MT60's, but they don't seem like they'd hold up to my kind of mileage. Here's a photo of the new BT-023 sitting on my balancing stand. For those curious, the 3D printed cones were a huge success. Less than $1 of plastic is better than spending $70+ on someone else's product. Granted, they aren't perfectly true, but for balancing it won't matter a bit. There seems to be a 2-3mm run-out at the edge of the rim. Got about 6k miles out of the OEM before the rear started coming apart (about 500 miles too many). Replaced them with a set of Metzeler Roadtec 01s and am loving them so far. Almost exclusive freeway commute at this point, but the ride is much improved. I'm excited to hear what kind of mileage you get out of the Roadtecs, these are what I was looking at for my next set of tires. Keep us posted! I got about 4k out of the rear on my Hypermotard (Pirelli Diablo Rosso II) before I wore it to the casing while slabbing back at the end of a 400 mile day. Great tires, but I'm trending towards distance and I can't really justify a new set every 3 - 4k so I'm planning to replace both front and read with the Pirelli Angel GT. In short, as most people agreeing the Michelin Pilot 3 or 4 is the better tyre for an all round everything? I have had 3 punctures on my Pirelli Scorpions! And am wanting something that is going to last slightly more miles. Front one is original at 5,500 and needing to change both now. My Michelin Pilot Road 4's have almost no detectable wear after 7000 km usage. I wouldn't however recommend them if you're planning to do any track days (I've seen what a track will do to them on a sport bike), but for normal street usage they're great. PR3s and 4s are old news. Try one of the newer sport touring tires. Last edited by RSL; March 30th, 2017 at 01:01 PM. Can confirm the Angel GT from Pirelli is pretty solid. I surprisingly managed to get about 4k out of the Diablo 3s that were on the bike before the cords started showing (I guess sustained 90+ MPH in headwinds is bad). Same sort of riding on the GTs and it took nearly 1k before the lightly embossed GT logo on the rear tire center tread disappeared. Last edited by N4teTheGreat; March 30th, 2017 at 01:49 PM. I ran the Angel GT on my VStrom and really dislike it. It grips fine, but the lack of feel is really upsetting. It just feels dead for some reason. 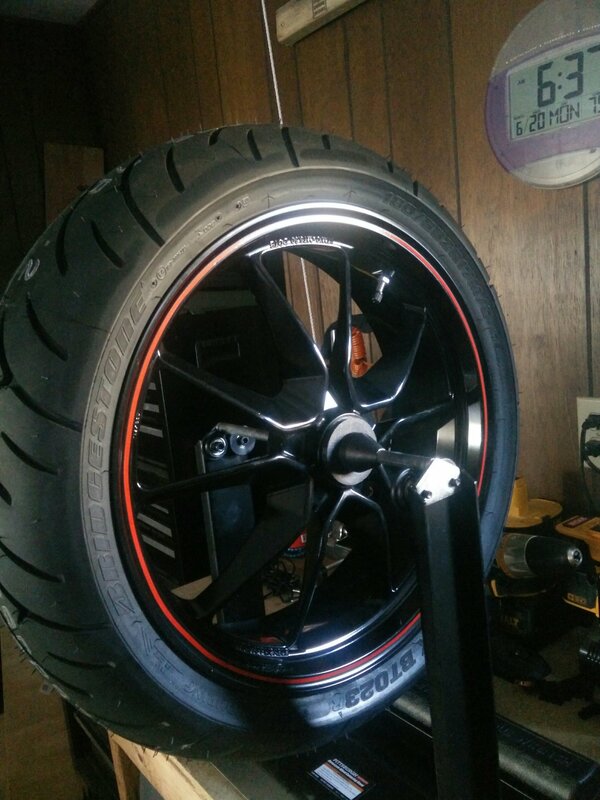 I'm replacing them with a set of Bridgestone T30 EVO. I ran the T30's before and really loved them. Maybe if the EVO's are good I will run them on the Hyper. Until then, still digging the M7RR. The PR4 has been around for a little while now, but hardly old news. I still think it's the best rain tire on the market. The number of sipes combined with soft compound make it pretty amazing. The only downside is the rounder profile makes them a little slow to turn-in, and they can feel a little squishy in certain conditions, lacking cornering stability.